I always buy bananas with the high hopes of smoothies for the week. I usually manage to use a few, but they turn so quickly. The minute I see a few brown spots, I whip up this easy Spiced Banana Poppyseed cake – perfect for an afternoon tea, dessert, or just in case company comes over. 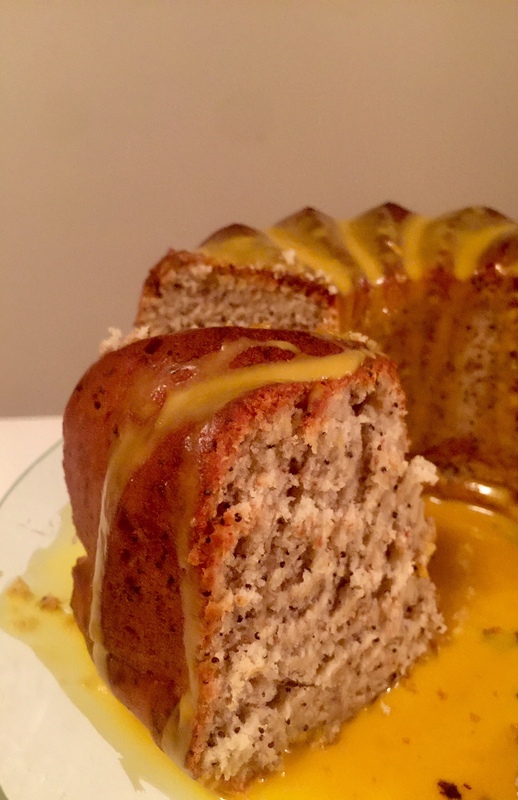 I like the good ol’ Bundt pan because it is both visually appealing and easy to bake. I prefer silicone when possible (makes a great cover for your finished product). Preheat oven to 375 F. Begin by mixing the dry ingredients (flour, baking powder, and salt) in a large bowl. In a separate bowl, mix the sugar and butter, using a high speed mixer. Add the eggs, extracts, and spices. Microwave the bananas in a small bowl for 60 seconds, mash (including the liquid that forms when heated), mash, and add to wet mixture. Slowly add and mix the dry ingredients into the wet, then mix on medium for two minutes once all ingredients are combined. As an alternative, you can also add chocolate chips or your favorite nuts once all ingredients are mixed. If you are using silicone, no need to butter or grease your pan – for all others, highly recommended. Bake in a 375 F preheated oven for approximately 35-50 minutes or until a knife comes out clean in the deepest part of the cake. Allow to cool before icing.